When I was pregnant with my first child, I probably googled this question on a weekly basis looking for confirming information about how a single-income family could live comfortably. This question was asked over and over on message boards that I frequented. The answer has always been the same and, even in a struggling economy, remains the same. Yes. You can afford to live as a single-income family with one parent functioning solely as a stay-at-home parent. The problem is, if you or your partner are not independently wealthy, you will probably have to sacrifice at least a little. On the other hand, if making sacrifices and giving up certain comforts doesn’t sound appealing to you, you could work from home and still get to be with your children. What are Your Priorities as a Mom? When I was a new mommy I felt that it was much more important for me to be at home with my young children than it was to own a bigger home, eat organic foods, take regular vacations and drive a nice car. I don’t regret my time spent at home with my children or any of what we had to give up. In addition, I always had some form of income, albeit sometimes it was a very small amount, to supplement. Now that my children are older the material sacrifices are becoming greater. Our priorities are changing and before we know it we’ll be running out of time to take family vacations and have completely-unnecessary-but-totally-extravagant holidays. And did I mention that I have three very active boys, one of whom is an athlete? Yeah. You don’t want to know what that grocery bill looks like. What if You Were a Stay at Home Mom AND a Working Mom? While at first it may seem that you have to choose either stay at home motherhood or working motherhood you may find that the choice isn’t so clear cut. 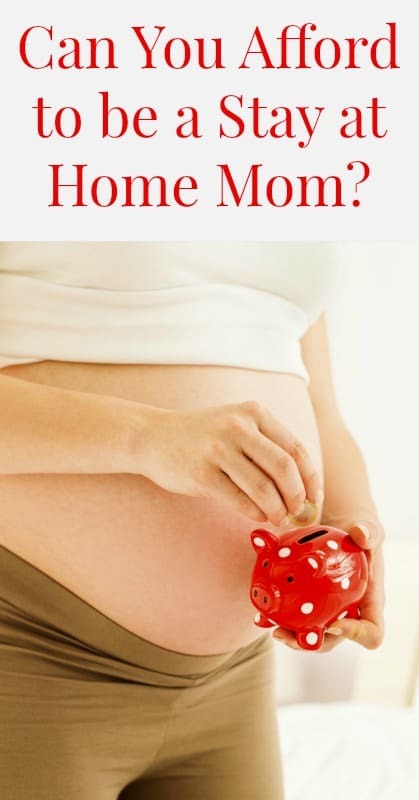 I know many other moms who are doing some combination of working/sahm possibilities. Remember to stay open minded and to do what’s best for your family and not what you think society or family and friends think you should do. I worked as a preschool teacher for a time while my children were younger and was able to bring them with me. Other options include cleaning houses, house or pet sitting, giving music lessons, tutoring, working at a gym with a daycare, caring for other children in your home and writing Kindle books. I know this is a tough one, but eating out should be limited if you are trying to stick to a tight budget. Get good at meal planning or spend a little on a meal planner like this one or this one that will save you a ton by helping you stick to your food budget and have a plan for dinner every day. That means less impromptu dining out and more money saved. Check out my work at home Pinterest board for several websites that offer jobs that are work-at-home friendly. It’s not difficult to find a job as a virtual assistant as long as you have a computer and a phone. You could start a blog, as many stay at home moms have done, but be aware that it can take time to make a full-time income from blogging. One very lucrative way to work from home is to build your own business through a networking marketing (multilevel marketing) company. Working a different shift than your partner allows both of you to spend time at home with your children. My husband and I did this when I worked part-time as a family therapist. He worked full time on 3rd shift and I worked part-time with a one-hour commute. It was not a good long term solution for us, but I eventually left the field of therapy and he got a new job. We survived it and were able keep one of us at home with the children all of the time and continue homeschooling them. There is something incredibly freeing about frugal and minimalist living. After reading the Life-Changing Magic of Tidying Up I was convinced that minimalism was what had been missing from my life all along. At this point I don’t practice frugal living out of necessity, but instead out of a desire to keep things simple. Sure we may go a bit overboard for holidays or special occasions, but for everyday living there is something very beautiful and joyful about simple, frugal living. For more tips on frugal living, check out my Frugal Living board on Pinterest.